Using his years in the New Mexico Army National Guard and as a living historian/reenactor Phillip writes soldier centric civil war fiction; stories that spin close tied historical facts with historic and fictional characters to teach and entertain about this period of US history. Interesting thing. I grew up in Grand Junction, TN which is a short distance from Shiloh and spent my childhood and teenage years roaming the battlefield whenever the family went there for an outing. But unless I’m going to a War Between the States site, New Mexico is my favorite palce. I love the food, scenery and the culture. Yes, New Mexico is far flung from the Civil War battlefields that take a special trip to plan to visit for me, but the weather and view can’t be beat! My wife and I re-visited Shiloh in 2008 to get pictures and the lay of the land for filling in some scenes in the novel but I still remember my first trip there when I was young (about 10 or so) and the color bearer graves from the 16th Michigan under the oak tree in the cemetery on the bluff overlooking the Landing. When I was in school (a long time ago) the 5 seige guns that Grant used were deployed in the correct location along the bluff. The bluff right there has since caved in and the guns relocated. One, I believe is in Savanah. Also, the water in the Tennnessee River used to be a clear blue. definitely no longer blue. Along the bluff would have been the best place, the line where the remaining ones are now would have been less advantageous for sure given the line of sight and trees (different trees). I also forget that time has made changes along the way in the river course, etc. Thanks for the comment! 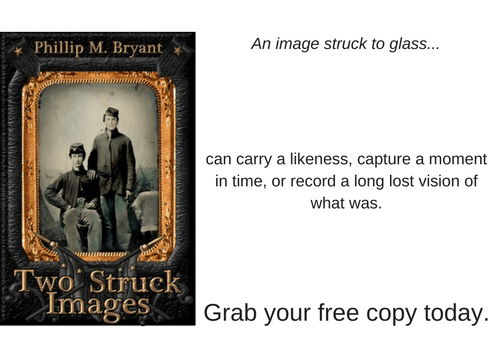 I just finished They Met at Shiloh and Two Struck Images. Both wonderful books. I can see a car ride to Georgia in the youngster’s future to find the lost photograph. I am one of the volunteers helping to restore the facade of Tara from Gone With The Wind. It is located in the Jonesboro, Ga. area where part of the battle of Atlanta was fought. Interesting; I’ve not been able to get to much else in Georgia battlefield wise other than Kennesaw Mountain; I have seen the cyclorama in Atalanta. Hi Jim, thanks for dropping me a line and I’m glad you enjoyed the read. This is why I wrote it, to focus on the common soldier and their experience.